1. Print out the Robyn embroidery pattern. Scale to desired size. 2. Cut 1 piece of muslin fabric and contrasting fabric to size of embroidery printout. 3. Trace Robyn pattern to muslin fabric by taping muslin over pattern on a sunny window (or use a conventional light box). 4. Backstitch using full strand for Robyn’s hair, face, arms and legs, dress pockets, and hair bow. 5. Backstitch eyes, nose and lips with a half strand (split thread and use three strands together). 6. Lay embroidered muslin on top of contrasting fabric and pin. Trace an outline of Robyn, adding approximately 1/4 inch of space between embroidery and sewing line. Cut along the outline. 7. Place right sides of both fabric pieces together. 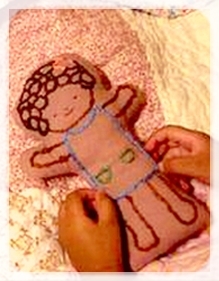 Pin and sew doll, leaving two finger’s width open at the base for filling. Turn right side out, fill with dried lavender and polyfil. Stitch doll closed.